Precious metals logged very narrow changes to start the new trading week on Monday. Silver led gains with a 0.4% pick up followed by a 0.1% rise in gold. Gold for August delivery climbed $1.40, or 0.1%, to end at $1,253.90 an ounce on the Comex division of the New York Mercantile Exchange. "Gold is threading water and appears to be biding time prior to the economic data later this week," MarketWatch quoted O’Byrne, a director at GoldCore. "After the positive [U.S.] jobs report last week, there is an expectation that retail sales may rise," he said. "A positive retail sales number could see gold come under pressure. A worse-than-expected number should lead to a safe-haven bid for gold." Gold prices on the day traded from a low of $1,251.60 to a high of $1,257.30. Gold advanced 0.5% last week. Silver for July delivery tacked on 8 cents to settle at $19.07 an ounce. Prices ranged from $18.99 to $19.19 and have ended higher in five of the last six sessions. Silver surged 1.7% last week. July platinum rose $1.30, or 0.1%, to $1,454 an ounce, trading between $1,444.60 and $1,456.50. Palladium for September delivery shed $2.65, or 0.3%, to $841.60 an ounce, ranging from $840.20 to $846.40. Last week, platinum inched up 30 cents and palladium gained 0.9%. Last week, silver added 0.2% and palladium rose 0.5% while gold fell 0.2% and platinum declined 0.8%. U.S. Mint bullion sales were spread across three different coins on Monday. In total ounces, American Gold Eagles added 4,000; American Silver Eagles gained 378,000; and America the Beautiful Five Ounce Silver Bullion Coins advanced 27,500. Today marks the debut of the 2014 Arches National Park Five Ounce Silver Bullion Coin from the Mint’s America the Beautiful series. First-day sales reached 5,500 coins. The U.S. Mint sell these 99.9% fine silver coins to a network of distributors at a price of $9.75 per coin, plus spot. Precious metals and coin dealers are now accepting pre-orders from the public. 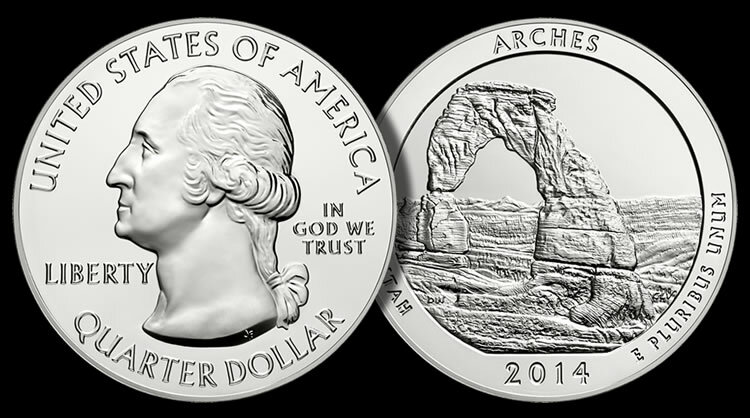 In related coin news, the Arches quarter was also released into circulation on Monday and the U.S. Mint started selling rolls and bags of them. Back to bullion and in coin totals, below is a sales breakdown of U.S. Mint bullion products with columns listing the number sold on Monday, last week, last month, the month so far, and the year-to-date.